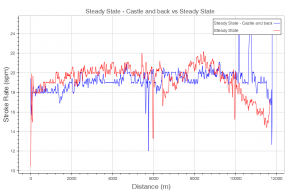 Sunday – Recovery / Monday – Steady State: Autumn Colors! The plan called for a recovery cross training. Romana had to pick up some things from the river club house of our rowing club, and the boys needed some exercise as well. So the four of us took bicycles and did a big 2 hour loop through Brno. First following the brook that flows through our neighborhood, then over the Lesna hill and down to the Svitava river, which we followed for about 25 minutes. We crossed Komarov to the other river, Svratka, and followed it back into Brno and to our rowing club’s river base. Then back uphill to Kralovo Pole and home. 27 km in total, 2 hours at a leisurely pace. 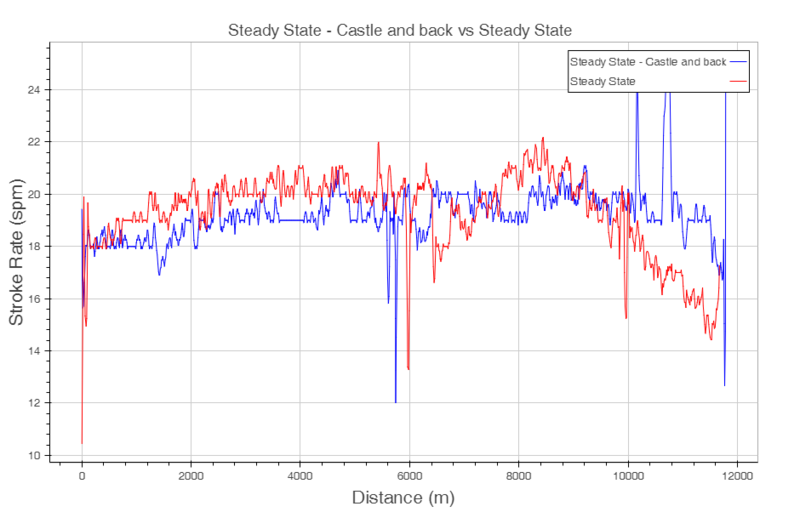 Average heart rate 97bpm, max heart rate 144 bpm when I was pushing Robin near the end. So not a very high suffer score, but I think the workout fulfilled its goal: Get some light exercise to help recover from Saturday’s session. And Saturday’s session was hard. I was still feeling it in my legs and shoulders and even got some massage to help recover from it. In the evening, I planned my workouts for this week, and I also started planning the next meso cycles. I have a head race coming Saturday, and after that it is no OTW racing until April. I admit that I am looking forward to the winter period. I always feel it’s a nice time of the year. 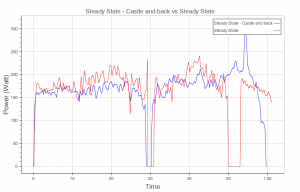 Many steady state sessions, laying the foundations for a successful next rowing season. For now, I am planning to do 4 Steady State rows, 1 other rowing session and one cross training session per week, plus cycling to and from work and strength training. The other session type will be “hard distance” trials in the beginning, as well as some of the lactate tests, although I am wondering whether I keep the “2 speed test” on the list. 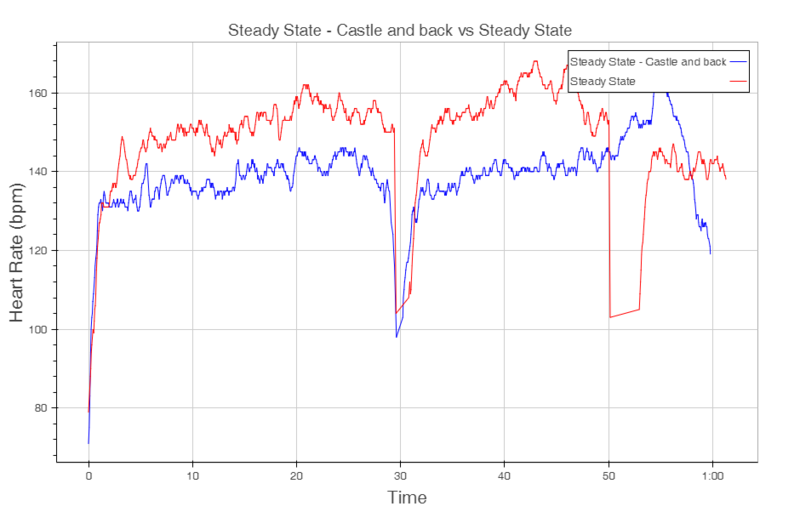 I feel like I am still recovering from Saturday’s session, but today was a nice steady state row in the single. I went up to the castle and back. If I had a camera with me, I would have taken a picture. In the gorge, the leaves are starting to get yellow and orange and it’s very beautiful. This will probably not last long because the forecast for this week is cold and rainy weather, and hard wind for this afternoon and Tuesday. Today it was fantastic. The temperatures haven’t dropped yet and the “rain” was just a mild drizzle in the last 20 minutes of the row. The water was flat. 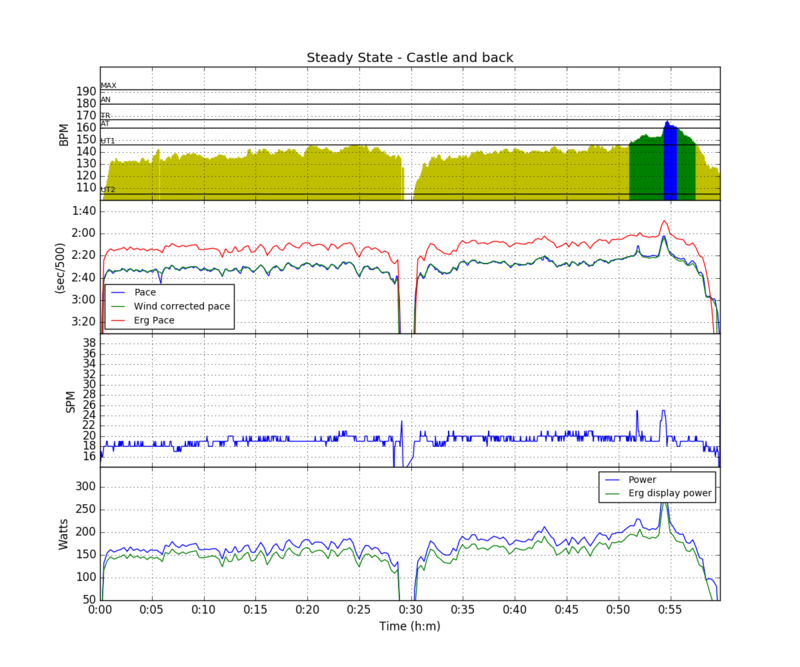 On the SpeedCoach, I had selected total time and total distance, and I didn’t know the heart rate until I analyzed the session afterwards. It turns out the average heart rate was only 139bpm. During the row, I tried to just focus on technique (and a bit of steering) and I was estimating I was going at around 170-180W of “equivalent erg pace”. 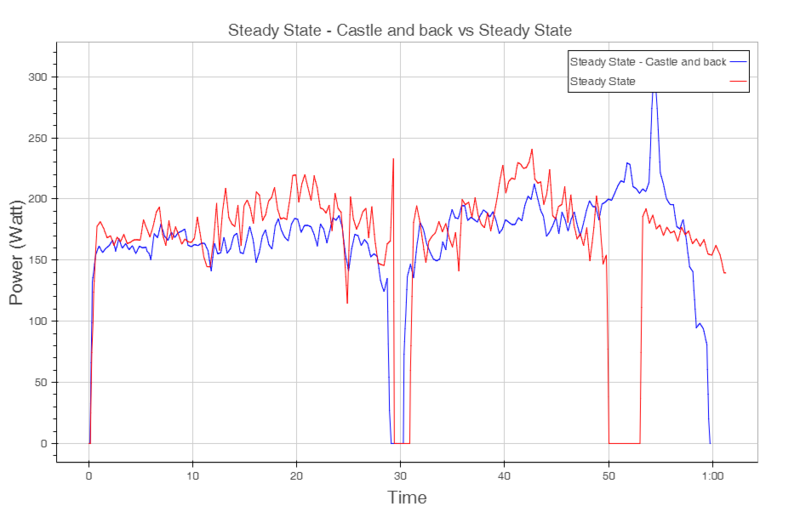 From the graph, it seems I was more at 150W, increasing a bit in the second half. So perhaps I was working less hard than I thought I was, but the pace was pretty OK. So on Tuesday I rowed with an average heart rate of 150bpm, same average stroke rate. Same average temperature. Same distance. A week ago, my average pace was 2 seconds per 500m faster. The difference is of course that a week ago, I started with a faster pace and a higher stroke rate, whereas today I eased into the session. If you’re wondering what the little pace jump is at the end of the row. Coming back to the lake, I met three of our elite scullers who had just completed their warming up. I passed them while they were turning around, and then they started their session. I am not sure what they were doing, but they were at 25spm and catching up with me. I first did a test, rowing their rhythm for a few strokes to assess what their stroke rate was, then waited until the second guy was next to me and switched to 25spm. I stayed next to him during the few strokes, and then I turned the boat towards our club house. It was interesting to do. This was a heavyweight guy who has more experience in sweep rowing, and his 2k erg is around 6:10. His stroke was noisier, heavier, harder, but my silent, light, and weak stroke was ok to stay next to him for a few strokes, doing 1:59-2:01 pace. The Y axis is “Drive Energy”, which is the amount of energy you put into the motion of the boat. 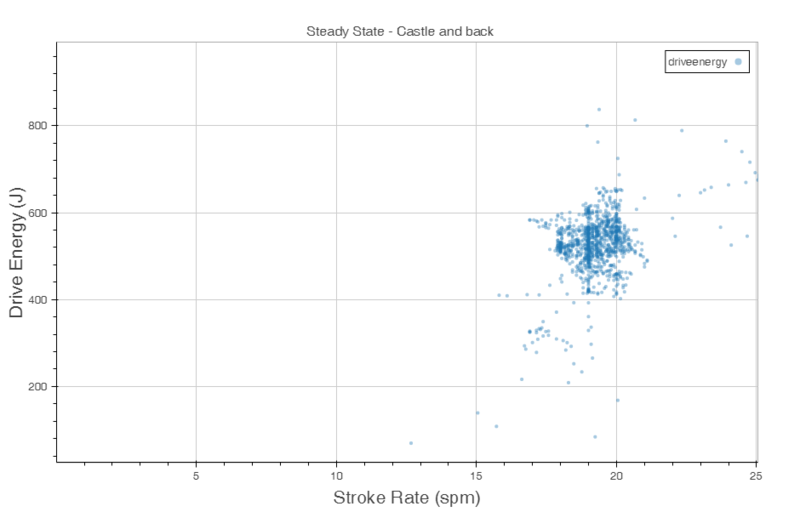 The X axis is stroke frequency. Multiplying these two parameters gets you the power. To illustrate this, rowing at 20SPM with 600J per stroke is the same power as 15spm with 800J per stroke, even though it will activate different fibers in your muscles. By the way, the energy per stroke is a parameter of the same dimensions as the infamous “SPI” that some people use on the erg.